The pisiform is one of eight carpal bones that forms part of the wrist joint. It is a small pea-shaped bone. The name pisiform is derived from the Latin word "pisum" which means pea. It can be felt on the anteromedial side of the wrist. 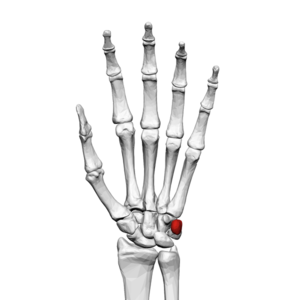 The pisiform can be found on the anteromedial side of the wrist in the proximal row of carpal bones. It is a small sesamoid bone, enveloped in the flexor carpi ulnaris tendon and can be easily palpated from the exterior. The pisiform serves as an attachment for tendons and ligaments. As it is a sesamoid bone, it acts as a pulley that provides a smooth surface for the flexor carpi ulnaris tendon to glide over. The pisiform also forms part of the ulnar canal or as otherwise called the Guyon canal. It is a fibroosseus structure that forms a groove between the pisiform and the hook of the hamate. The ulnar nerve and ulnar artery pass through this canal from the distal forearm into the hand. The pisiform does not form part of the wrist joint movement, unlike all other carpal bones. It is situated where the ulna and the wrist meet but articulates with the triquetrum only. It lies in a plane anterior and superficially to all other carpal bones. Flexor Carpi Ulnaris – This is an extrinsic muscle that attaches to the pisiform, hook of hamate and 5th metacarpal. It allows wrist flexion and adduction. Abdutor digiti minimi – This is a hypothenar muscle. It allows abduction of the 5th finger and flexion of its proximal phalanx. ↑ Wadsworth CT. Clinical anatomy and mechanics of the wrist and hand. Journal of Orthopaedic & Sports Physical Therapy. 1983 Apr 1;4(4):206-16.